Did you grow up with any local/regional legends, spooky stories, mysteries, or the like? 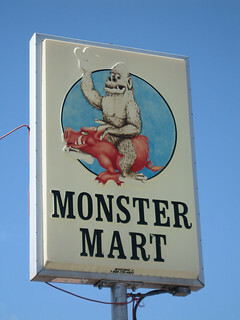 Aside from the reported local "haunted houses," I recall vividly tales of the Boggy Creek Monster (a.k.a. 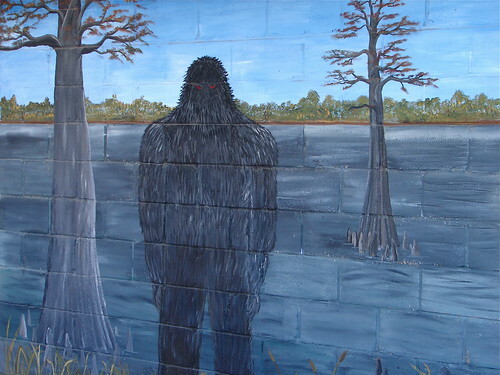 the "Fouke Monster" or "Southern Sasquatch"). 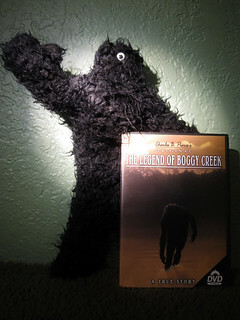 The phenomenon centers primarily around the Boggy Creek area on the border between Arkansas and Texas, but it still made its way up to Tulsa, Oklahoma, where I was raised -- the story, that is, not the creature -- especially via the 1972 docudrama The Legend of Boggy Creek (which turned out to have a profound effect on the style of 1999's The Blair Witch Project, interestingly enough). Some in the region wholly embrace this variation on the Bigfoot theme, as you can see. I'm not yaying or naying the actual existence of the creature, as I haven't made a systematic study of the reports, sightings, and evidence. (I understand that annual regional conferences on the subject of the "monster" today draw reputable scientists from various universities and institutions as well as lay enthusiasts and local celebrants.) I'm simply saying that it seems very much in the Halloween spirit to appreciate any community that embraces its "darker side." How about you? Do you have any local/regional stories to share? To listen to my lonely cry?" Note: No cattle were mutilated in the making of this post. Oh, this is brilliant! I hadn't read about bunyips before. Thank you so much for the links! I love the fact that your town was named after them. That's so clever. Not even in the Temeraire books, by Naomi Novik...? Alas, I've only read about the books, I haven't read them myself. They're on my hopelessly long "to read" list, though! Re: "his wet, rotting compost heap stink" = yikes! Oh, but of course! The bogeyman of all bogeymen. Great stuff! :) Thanks for this. The reality of Yeti may have been proven, and the truth of it is actually pretty awesome. *slaps forehead* I meant to comment on that in your LJ. This is amazing news -- and, you're right, pretty awesome, too. It's strange that you've heard about such a legend and I, a native Texan, have not! Thanks for drawing my attention to it... 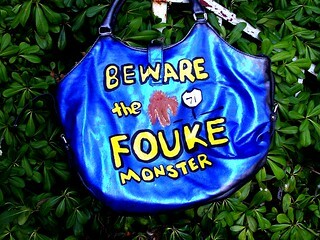 I will have to look out for the Fouke Monster next time I drive through Arkansas! "Note: No cattle were mutilated in the making of this post." Oh man... Skillet was one of my favorite bands when I was in jr. high and only listened to Christian music. Oh wow, I didn't realize that was your high school. That's incredibly sad. I just can't imagine... I'm really impressed by your school newspaper staff for taking that on and doing such a great job with it. He is also supposed to be the inspiration for The Hound of the Baskervilles. Conan Doyle was staying on the Norfolk Coast when he wrote it. I think your local legend wins the prize. It really doesn't get better than that. I've been to Blythburgh church and seen the scorch marks on the door. It's quite creepy! And I had two students a few years back who were absolutely certain that they had an encounter with Black Shuck on the Suffolk Coast. One of them wrote his screenplay about it. Fantastic! Thank you so much for this. I love the Conan Doyle connection -- and the connection to your students! Near my grandparents' house is the statue of the Dungarvon Whooper, a spooky story I heard often growing up (my grandfather had worked in the lumber camps when he was young). The Coleman Frog story is wild! It was larger than Virginia, the Boston terrier (and 20 lbs. heavier, apparently)! That's some frog! Where are Mulder and Scully when you need them? Great stuff. Thank you for the fascinating links. I think through much of the southwest and Mexico, it's La Llorona. I remember the first time I was told about her, a bunch of us were out at night near one of the large canals that run through Phoenix. That is a tragic tale! ::shudders:: Thanks so much for the link. I remember the first time I was told about her, a bunch of us were out at night near one of the large canals that run through Phoenix. Oooh, a spooky atmosphere for a spooky story! Very appropriate indeed.